Parents: always a part of the Warhawk family! Helping your son or daughter choose where to go to college can sometimes be difficult. Whether you need to know about majors, tuition, room and board, financial aid, or other aspects of university life, ULM is here to help you! Even before a university choice is made, we want to welcome you to our campus. We'll answer all your questions and you are always welcome to take a campus tour with your student. Campus tours provide a great opportunity to get information about admissions, financial aid, and scholarship opportunities. You can experience first-hand a bit of campus life. Even if you attended ULM or lived in the area for years, we encourage you or your student to schedule a campus tour. Although a number of recruitment events are scheduled throughout the year, our Browse on the Bayou event is not to be missed. Browse on the Bayou is a special visitation day traditionally held on a Saturday and is designed with high school juniors, seniors, and transfer students in mind. You will have an opportunity to visit with ULM's faculty and students. "Browse" includes specific sessions for financial matters, academics, optional tours and more. Parents are encouraged to attend "Browse" with their student. Every summer ULM offers PREP (Preview, Registration, and Enrollment Program), a summer orientation for incoming freshmen. For parents, ULM offers POP (Parent Orientation Program). POP sessions run during the same session dates as PREP, but is a separate program. Parents receive information to help their student during their first university year. At POP, you will discover more about what ULM has to offer your student. Our recruiters may be at your son or daughter's high school, science fair, career fair, or other event. Additionally, they may receive information from us through the mail, from a high school counselor, or even former classmates who are now WARHAWKS! 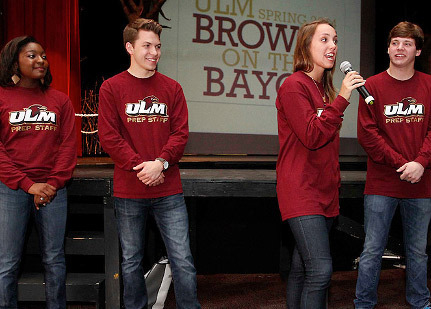 Encourage them to contact us at askace@ulm.edu or 1-800-372-5127 to answer their questions and find out more about ULM!